The 1989 Ironman(R) World Championship was the greatest race ever in endurance sports. In a spectacular duel that became known as the Iron War, the world's two strongest athletes raced side by side at world-record pace for a grueling 139 miles. Driven by one of the fiercest rivalries in triathlon, Dave Scott and Mark Allen raced shoulder to shoulder through Ironman's 2.4-mile swim, 112-mile bike race, and 26.2-mile marathon. After 8 punishing hours, both men would demolish the previous record--and cross the finish line a mere 58 seconds apart. In his new book "Iron War," sports journalist Matt Fitzgerald writes a riveting epic about how Allen and Scott drove themselves and each other through the most awe-inspiring race in sports history. Iron War goes beyond the pulse-pounding race story to offer a fascinating exploration of the lives of the world's two toughest men and their unquenchable desire to succeed. 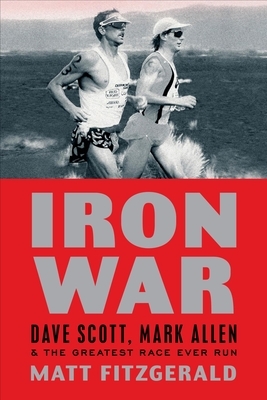 Weaving an examination of mental resolve into a gripping tale of athletic adventure, "Iron War" is a soaring narrative of two champions and the paths that led to their stunning final showdown.